For Jean-Marc Vallée, making his next film with Martin Scorsese is the chance of a lifetime. "I'm so excited. It's such a unique project, and such amazing people are involved. I feel very privileged," an ebullient Vallée told Playback Daily. The Young Victoria is written by Academy Award-winning scriptwriter Julian Fellowes (Gosford Park) and follows the life of the British monarch in the years immediately after she ascended to the throne in 1837, at age 18. "I'm fascinated by a woman who assumed such great responsibility at such a young age," says Vallée. "She basically said, 'You watch me, I'm going to be a great queen.' And she was." The Young Victoria, which will also look at the queen's intense romance with her husband, Prince Albert, is co-produced by Graham King (Gangs of New York), Scorsese and -- both fittingly and curiously -- the Duchess of York, Sarah Ferguson. Vallée, who recently spent two weeks in London working on the script with Fellowes, says he read dozens of scripts before The Young Victoria. "I read it right through. I finally found something I liked. She is such an incredible character. I was captivated." Vallée believes he was chosen to direct the film because of the unique approach he took with C.R.A.Z.Y. "C.R.A.Z.Y. is a classic story with elements of fantasy. I want to do the same thing with this story. I want to give it an edge and push the envelope." Queen Victoria ruled from 1837 to 1901, a period when Quebec (then Lower Canada) was very much under the thumb of the then-powerful British Empire. But Vallée doesn't find it odd that a French-speaking Quebecer is making a film about one of the most powerful symbols of British imperialism. "This has nothing to do with politics. I'm there because I know how to tell a story," he says. The film will be shot in London; no date has yet been set. For previous posts on this topic, see February 11: New Film on Queen Victoria's Early Life in the Works and February 16: Update #1: "The Young Victoria" Film. For a later post on this topic, see March 4: Update #3:"The Young Victoria" Film. 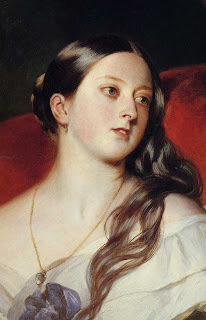 Shown here: Queen Victoria at 24 by Franz Xaver Winterhalter.